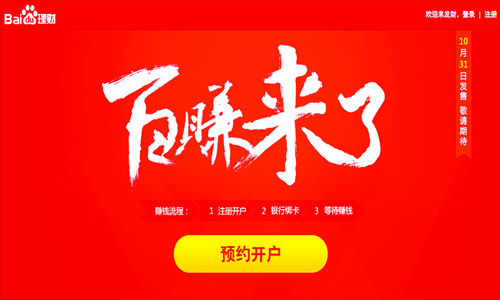 China's leading online search engine provider Baidu Inc is to launch its second investment product, Baizhuan, on Thursday, only three days after it launched its first, Baifa, on Monday. Baidu and China Asset Management Co will co-launch Baizhuan, which will invest in financial instruments with stable returns, such as government bonds with a maturity of one year or less, central bank bills and certificates of deposit. The product release comes at a time when several large Internet and e-commerce companies, such as Alibaba Group, have shown interest in or made moves to tap into the online financial service market. The minimum investment for Baizhuan is 1 yuan ($0.16), and buyers are allowed to cash in and out anytime, Baidu said. The company said the annual return of a typical Baizhuan account was 5.05 percent on October 23 using an estimate, while bank deposit interest rates are 0.35 percent and the yield of Yu'ebao, an online financial service provided by Alibaba, was 4.75 percent Wednesday. Baidu sold out its 1 billion-yuan quota for its first product within four hours after its launch Monday, the company said. Baidu decided to launch Baizhuan partly to attract customers who failed to grab a share of Baifa due to the sales quota, said Lu Zhenwang, founder of Shanghai Wanqing Commerce Consulting. However, many potential buyers said online they did not plan to invest in Baizhuan because its return is "regular" and "unimpressive." Lu said Baizhuan's return is "uncompetitive" and the product "does not have a key feature to entice potential buyers." Baidu is hindered by the fact that only investors with accounts from a limited number of banks are able to make purchases after bundling their bankcards with their online wealth management accounts, Lu said. Baidu's financial products are now open to account-holders from seven banks, including China Construction Bank and China Merchants Bank, but not for those with accounts from the Bank of China and the Industrial and Commercial Bank of China, the country's largest State-owned commercial bank. Alibaba allows users of Alipay, China's largest online payment platform, to invest in Yu'ebao. Investors can transfer money into Alipay from accounts and using cards from any bank in China. "It will be very difficult for Baidu to form alliances with banks because the company is stealing the banks' customers to invest in its own product," Lu said. "If Baidu cannot strike deals with more banks, it will face serious limitations in the future."